This dial indicator can be used with all Compac bore gages with measuring range .5" and larger. For new bore gage indicators and detailed information on this dial bore gage, please see page 39. These are the same parts used by Alina, Interapid and SPI dial bore gages made in Switzerland. The old Alina W28 indicator used different parts, all of which are obsolete. You can place an online order for any parts which have a price shown by clicking on the linked part number. Parts without pricing are no longer available from us while we conserve stock for our own repairs. For information on Compac bore gage repair service, see page 30. The old style bezel lock (left, in photo) has a slotted screw and a thread diameter of 1.6 mm. 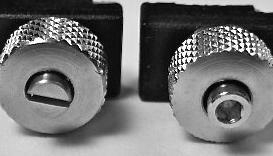 The new style bezel lock (right, in photo) has a hex screw head and the thread diameter is 2 mm. Both styles are still available. They are not interchangeable. In either case, the lock consists of three elements: the screw, the knob and the plastic clamp. The old style bezels and associated parts are no longer available: specifically the chrome bezel (#530-71), the tolerance markers (#530-80), the ring with crystal (#530-78) and the retaining ring (#530-082). It's been more than 10 years since these parts were replaced with a color coded bezel and a snap-on crystal. However, the bezels for the bore gage indicators are different from the regular dial indicators. The colored bezels for the bore gage have 6.2 mm high rims. The regular indicator bezels are larger, at 8.2 mm. You can also recognize the bore gage bezels because they’ve been turned down and portions of the coloration are removed in the process. ** 042000 is the conical screw which is used to attach the indicator to the measuring head. The new screws are 6 mm long but some older bore gages used 5 mm screws. It's easy to strip the thread in the housing by over-tightening this screw since the indicator body is brass, so use caution. It could be a costly mistake. You will notice, upon closer examination, that this parts list also includes parts for the metric dial bore gages.